Deep fried rolls stuffed with corn, black beans, chicken, bell peppers, onions, tomatoes, and spicy white sauce. Cheese dip, guacamole dip, mozzarella sticks (4), mini chimis, and a cheese quesadilla with a side of sour cream. Crowd favorite! Fish, shrimp, avocados, tomatoes, cilantro, and onions cooked to perfection in lime juice. Shrimp, steak, and chicken with vegetables. Ranch, Italian, French, or Balsamic dressing available upon request. A crisp tortilla bowl filled with ground beef or shredded chicken, lettuce, tomatoes, cheese and sour cream. A crisp tortilla bowl filled with your choice of grilled chicken or steak topped with grilled vegetables, lettuce, tomatoes, sour cream, and cheese. Warm, fresh off the grill chicken, steak, and shrimp, with ice cold lettuce, tomatoes, onions, cucumbers, topped with cheese. Served with rice, beans, lettuce, sour cream, & pico de gallo. Two quesadillas, your choice of steak, chicken, or one of each. Oversized flour tortilla grilled and stuffed with steak, chicken, and shrimp. Your choice of fajita meat cooked with onions, tomatoes, and peppers. Two quesadillas filled with cheese, grilled onions, tomatoes, peppers, broccoli, and mushrooms. Fajitas are cooked with tomatoes, onions, and peppers on a sizzling skillet, and served with beans, rice, lettuce, sour cream, pico de gallo, and three flour tortillas. Grilled peppers, onions, tomatoes, broccoli, and mushrooms. $33.00Muchas Fajitas Dinner for two! Steak, chicken, shrimp, and chorizo cooked with onions, tomatoes, and bell peppers. BIG HUNGER? This fajita is for you! We start with a blend of hand trimmed beef, chicken, shrimp, and chorizo cooked with natural pineapple juice, bell peppers, onions, and tomatoes. Once cooked to perfection, we top it with our homemade cheese sauce. Four enchiladas filled with grilled peppers, onions, tomatoes, broccoli, and mushrooms. All topped with our special sauces. Combination of 6 enchiladas (2 beef, 2 cheese, and 2 chicken) all topped with our special sauces. Six enchiladas, (3 shrimp, 3 crabmeat) All topped with our special sauces. Make your own dinner, choose two or three of your favorites! Choose ground beef or chicken (substitutions may affect pricing). Grilled chicken or steak with zucchini and bell peppers served on top of a bed of rice and covered in cheese sauce. Two flour tortillas, soft or fried, filled with beef tips or chicken. Served with rice, beans, lettuce, pico de gallo, and sour cream. Shrimp cooked in a spicy hot sauce. Served with rice, beans, lettuce, pico de gallo, sour cream, and three flour tortillas. Pork chunks cooked with our own secret spices. Served with rice, beans, lettuce, pico de gallo, sour cream, and three flour tortillas. 3 corn tortillas with steak, chicken, or chorizo topped with cilantro and onion. Served with a side of rice and beans. Served with lettuce, sour cream, pico de gallo, rice, beans, and three flour tortillas. Grilled chicken prepared with cheese ranchero sauce. Grilled chicken topped with our seasoned chorizo and melted cheese. Two savory steak slices served with rice, beans, lettuce, sour cream, pico de gallo, and 3 flour tortillas. Served with your choice of fries or rice and beans, and a drink. Hard or soft shell taco, your choice of beef or chicken. Flour tortilla fried with honey, butter, and cinnamon. Add any item to your meal. Choose from ground beef, beans, chicken, or beef tips. All options come with cheese. 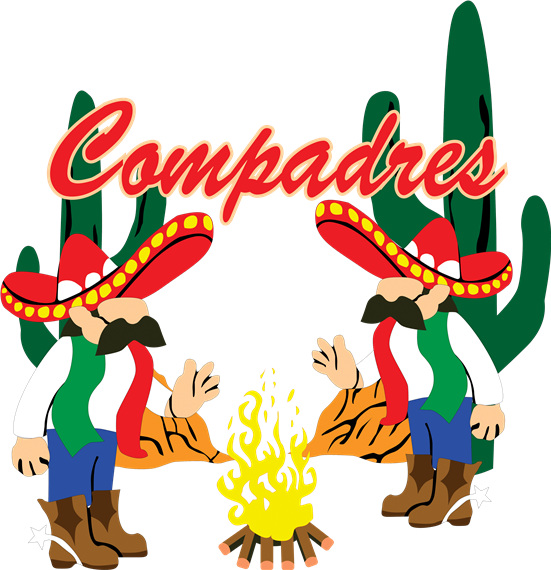 First basket of chips and salsa are compliments of Compadres with your lunch or dinner. Refills of chips or salsa are $.99 each.